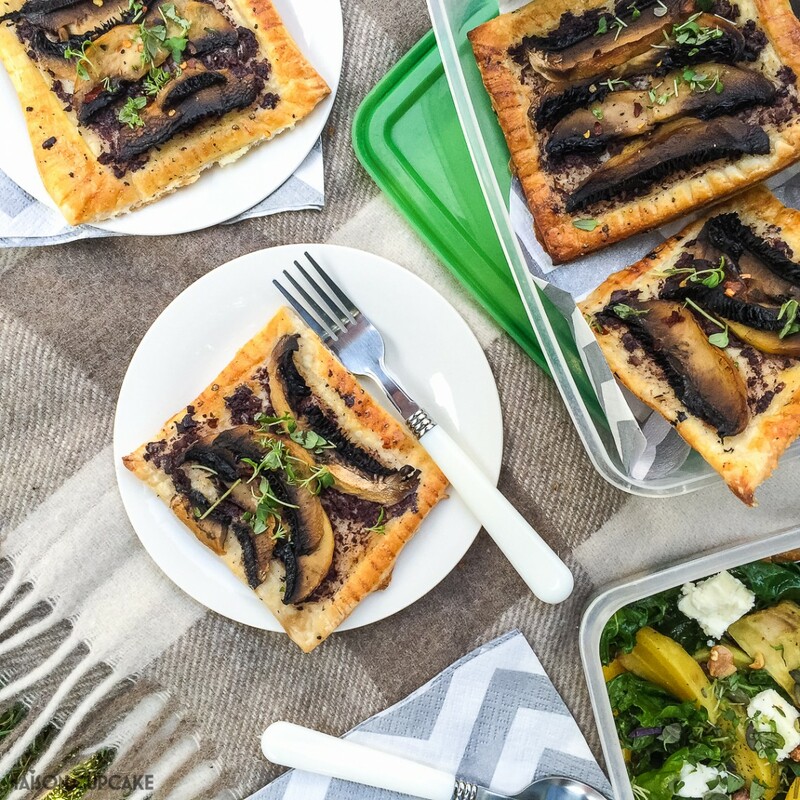 These tasty portobello mushroom puff pastry tarts only need five ingredients, around 30 minutes to make and are the perfect addition to your picnic or packed lunch. June 11-19 marks the UK’s optimistically scheduled National Picnic Week. The weather has been hit and miss so far this summer but as a family we’ve grabbed every opportunity to eat al fresco. 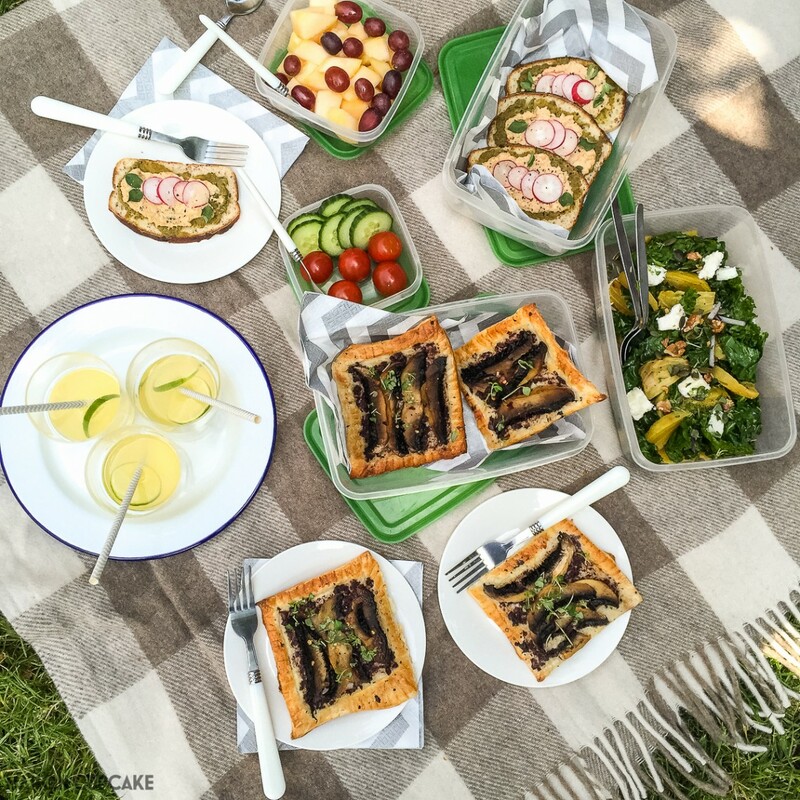 I’ve already shared my summer Mediterranean menu for six and then last weekend we got the picnic basket and blanket out for this mushroom filled feast on the back lawn. 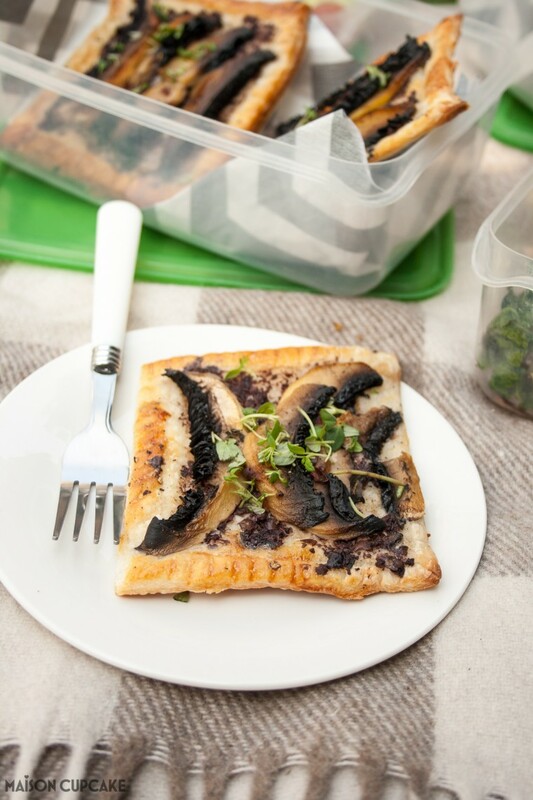 These lovely dark portobello mushrooms are packed with flavour and laying them on sheets of baked golden puff pastry is a portable way to enjoy them outdoors. A pastry base spread with black olive tapenade boosts the umami factor. A 500g block of puff pastry is enough to make eight of these savoury puff pasties or you could use half the pastry to make something sweet for dessert. 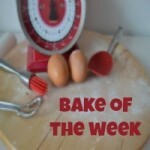 Baking time is under 15 minutes meaning you can maximise your time in the great outdoors. Mushrooms are a versatile vegetable you can enjoy all year round and can make a valuable contribution to a healthy diet. Mushrooms are a good source of B vitamins, dietary fibre, anti-oxidents, a vegetarian source of protein and one of your five a day. What’s not to love? You could serve these mushroom pastries also as a light vegetarian lunch or make them smaller as party appetisers. Truffle oil really ramps up the mushroom flavour if you have this but otherwise olive oil is fine. 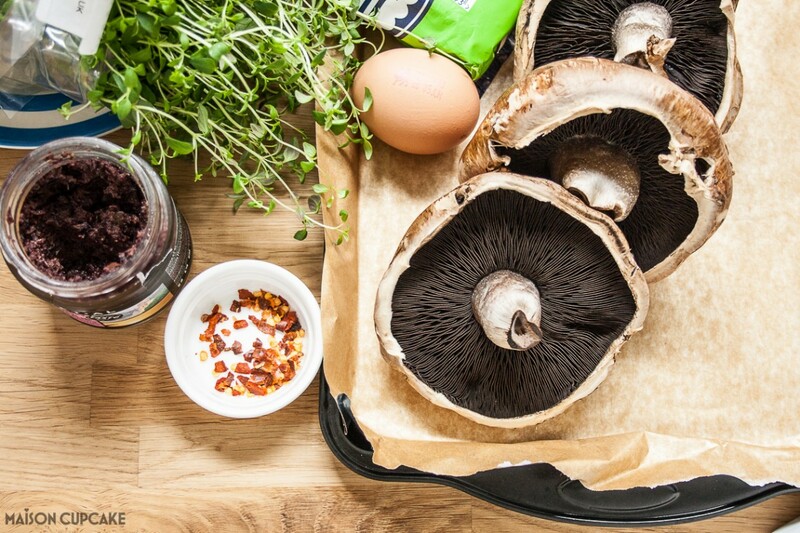 You only need five ingredients to make these portobello mushroom tartlets – puff pastry, nice big dark portobello mushrooms, black olive tapenade, oil and a dab of egg wash to make the pastry golden. 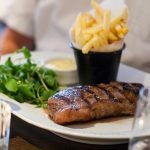 Optionally you can add chilli flakes and garnish with fresh thyme. I admit, I add chilli to virtually everything I eat but you don’t have to! 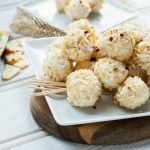 This is a vegetarian recipe easily adaptable for vegans if you sub the egg wash with something else such as a mix of soy milk and agave nectar. 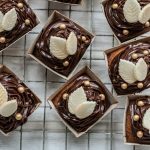 Pre-rolled puff pastry in boxes is often made only with vegan ingredients rather than butter so you might not have realised you were already eating a vegan friendly product. 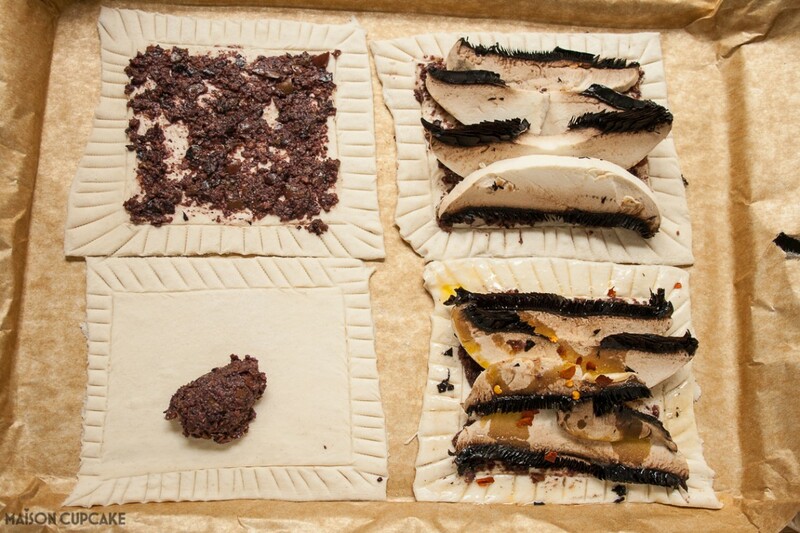 Here is a visual aid to how to build up your mushroom pastries – score the pastry, spread black olive tapenade, just add mushrooms slices and finally drizzle over the oil. Remember that sprinkling of chilli flakes is optional. A printable recipe sheet is available for you below. Roll out the puff pastry to 5mm thick. Cut into rectangles around 9 x 12cm. Score the edges of the puff pastry rectangles to leave a 1cm border. Lay the rectangles on baking sheets lined with non-stick baking parchment paper. Spread heaped teaspoons of black olive tapenade on each rectangle leaving the borders clean. 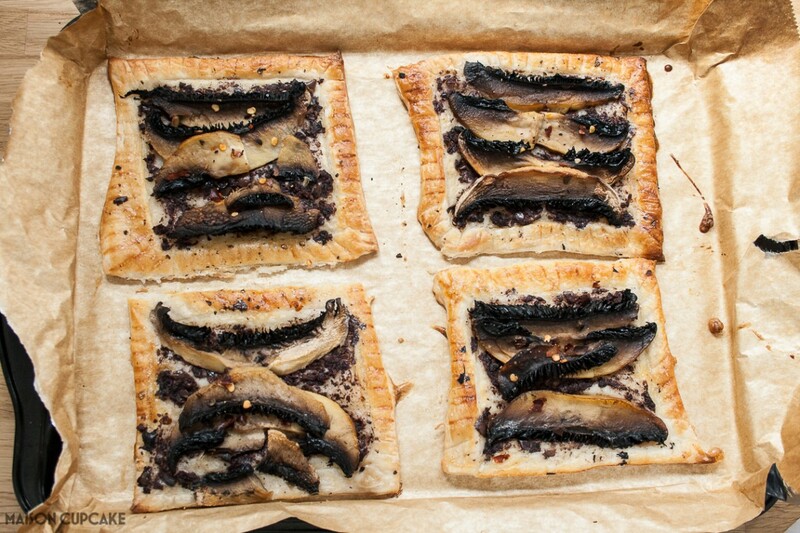 Lay slices of portobello mushroom on the tapenade, drizzle with oil and scatter with chilli flakes if desired. Brush beaten egg on the pastry borders. Bake for 12-15 minutes until puffed up and golden brown. 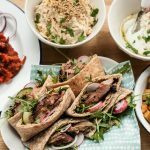 Can be served immediately or cool and box them up for your packed lunch or picnic. We enjoyed our mushroom tartlets with open sandwiches spread with hummus, pesto and radish slices as seen in my recent focaccia in a stand mixer post. The salad on the right is kale, golden beetroot, feta and walnut which I may blog separately elsewhere soon. 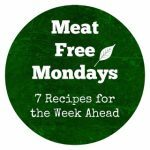 Here are some more ideas from fellow blogging friends to Just Add Mushrooms – go check them out! 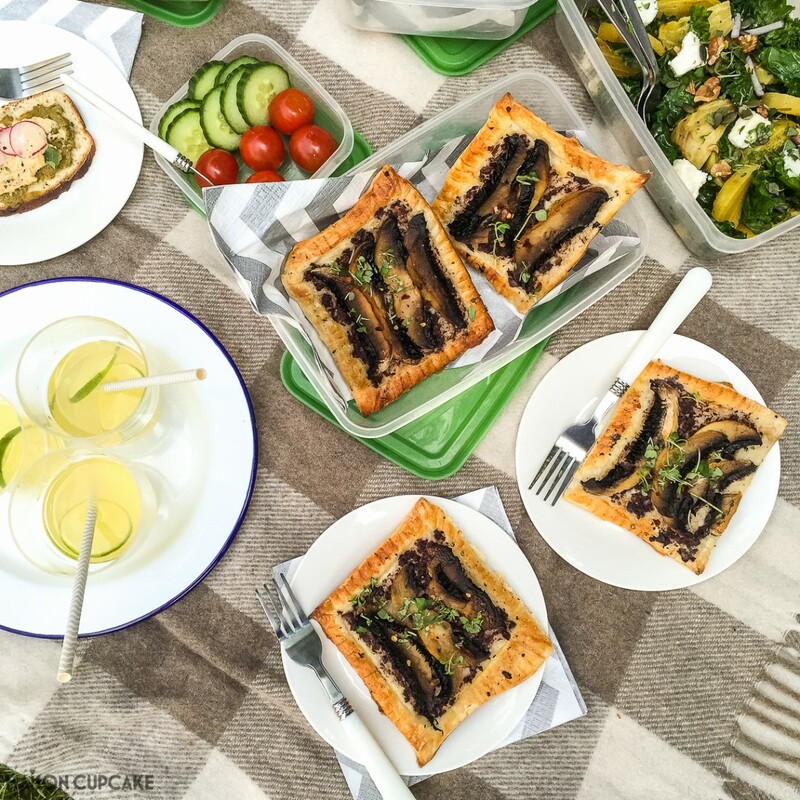 This portobello mushroom puff pastry tarts recipe post was commissioned by The Mushroom Bureau – follow them on Twitter @moretomushrooms – as part of their #MTMsummer Just Add Mushrooms campaign. How you do like your mushrooms? I don’t think I go a week without buying mushrooms, they’re a cupboard staple item for us. I am absolutely loving the look of these! The perfect summer picnic item! Thanks – they were really tasty and perfect portable food! oh wow… these are absolutely beautiful and exactly what I want for lunch today. 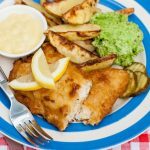 Such a simple but very tasty dish and perfect for the picnic! What a stylish spread Sarah! 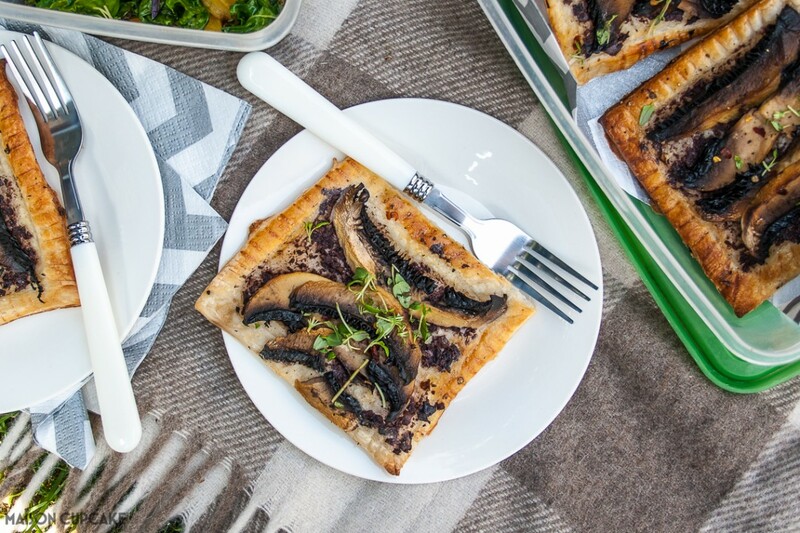 The mushroom tarts are just the kind of thing I love to eat in the summer with heaps of salad. I love how simple they are to make too. 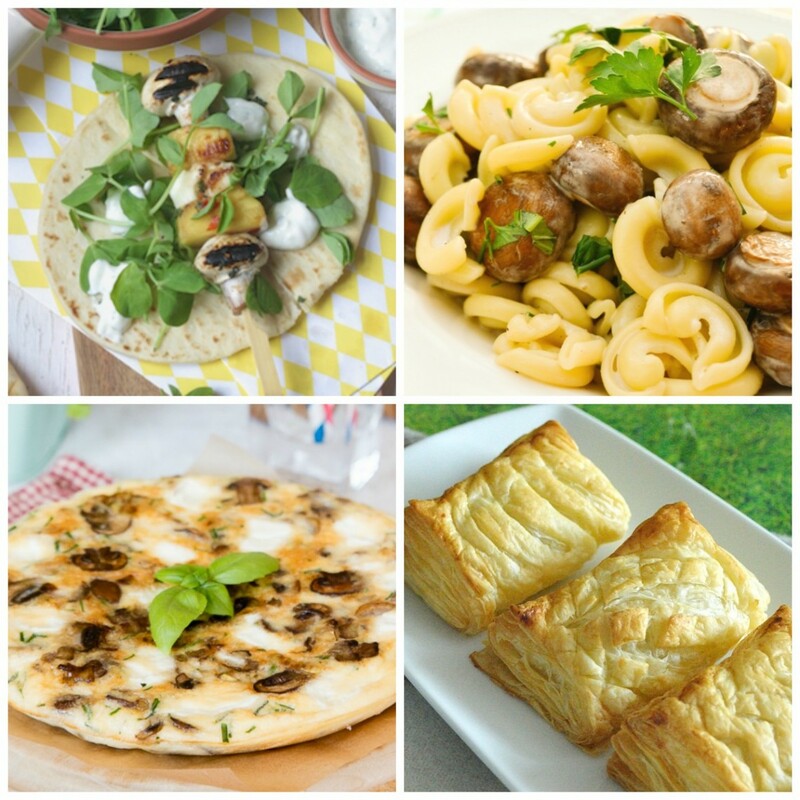 So easy and tasty – love puff pastry tarts : ) Need to make some mushroom ones and soon! 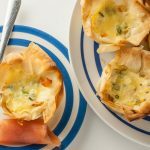 These are fabulous Sarah – I do love a puff pastry tart, and the portobellos are so full of flavour! 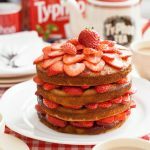 Thanks for sharing this with us, i can’t wait to try it out with my kids on our next picnic in two days time. Awesome post, kudos!!! 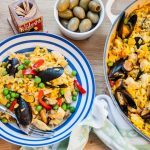 I don’t know I shared your recipe when it was published but obviously forgot to leave a comment. Just came over to drool again and check the recipe. Love all the mushrooms in it, they really are the star of the show.